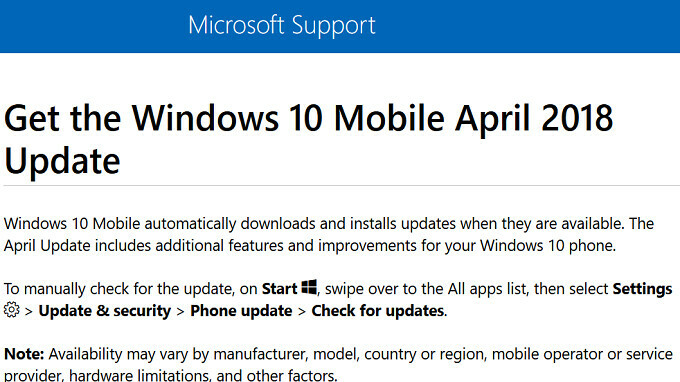 Microsoft's own support page now includes a bulletin from the software giant that says Windows 10 Mobile powered handsets will be receiving the April 2018 software update. As Microsoft notes on its support page, "Availability may vary by manufacturer, model, country or region, mobile operator or service provider, hardware limitations, and other factors." While these handsets automatically download and install updates when available, you can try to get it manually by going to Settings > Update & security > Phone update > Check for updates. The version of Windows 10 Mobile that includes the update is 1803. Some users of Windows 10 Mobile handsets tried to pull out the April 2018 update manually, and came away with bupkis. As we noted, Microsoft warned that not every model is receiving the update. Still, there is a chance that this is all a mistake; after all, Windows Phone is not exactly a top priority for Microsoft at the moment-if it ever was. Microsoft will officially walk away from Windows 10 Mobile on January 8th, 2019. Until then, the company will support the platform with bug fixes and security updates, but will not disseminate any new features for the phones. Update: I just installed a new update today (May 12) and the version is still 1709. Edited, Because my first comment duplicated again. Alan, Could you also please credit the source from where you got the story? Please check the email. Thanks! I received the April update and it was limited to security updates and a slightly crippled Outlook, but it's still on 1709. I have the unlocked Idol 4S from Microsoft btw. That has nothing to do with the new 1803 update. Wait till tomorrow.